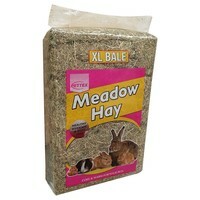 Pettex Meadow Hay Compressed XL Bale is ideal bedding for rabbits, guinea pigs and other small animals. As this high quality product has been cut from an old established pasture it is likely to have a diverse range of different grasses and a sweet, fresh smell. Your pet will love to use this natural, compressed meadow hay to make a cosy and warm bed for itself. Healthy, hygienic and dust free. Please note that very occasionally, small hawthorn branches, thistles etc. can be hidden in the long grass and is picked up with the hay. My rabbits seem to like eating this and you get alot for the price.